Huntsville, nicknamed "The Rocket City" due to its close ties to the space program is a city with an eclectic mix of rich history, artistic appeal and family-friendly fun. This mix makes Huntsville an ideal destination for travelers of all ages, but particularly for families. The boys and I made Huntsville the first stop on our #90DayRoadTrip, and have spent the last few days sampling some of the best attractions, events and food the city has to offer. If you like to mix some learning into your family trips, then Huntsville, AL. is the perfect destination for your next trip. Check out just a few of the options available for educational fun. Part of the EarlyWorks' Family of Museums, the EarlyWorks Children's Museum is a history museum, but not some run of the mill boring history museum. The EarlyWorks Children's Museum brings history of the Huntsville area to life with dozens of hands on activities for kids of all ages. Here, children can enjoy activities like setting the table for dinner in a replica of a pioneer cabin, building various versions of early pioneer architecture, stepping on board a keelboat and hoisting the flag, and even taking a stroll through the history of the area's African and Native American cultures. See what it was like to run a general store in the 1800's, and take in a puppet show or story told by the Talking Tree. Through in history of the state's constitution and some arts and crafts, and you have a full afternoon of educational fun that will have the kids craving more. Entry to the museum is $12 for adults and $10 for children ages 4-17, but discounted tickets to all 3 Earlywork's Museums can also be purchased. Also part of the EarlyWorks Family of Museums, the Alabama Constitution Village is a recreation of an 1819 village, which includes the actual building where Alabama's state constitution was created and signed. You can walk the grounds of the village, taking in historic homes from prominent Huntsville citizens like John Boardman who owned the print shop and the home of the town lawyer Clement Comer Clay. Although you can walk the grounds on a self-guided tour, I highly recommend meeting up with some of Alabama Constitution Village's live interpreters for a tour, as they really make your visit something special. Packed with loads of knowledge, you will see live demonstrations and learn fun facts such as where the names upper and lower case letters came from. Before you leave, be sure to stop by and see Alabama's replica of the Liberty Bell. Each state was given a replica of the bell in 1950, and Alabama's is on display here. If you are lucky and are escorted by a guide, you might even get the chance to ring it as we did on our visit. Tickets are $12 for adults and $10 for children ages 4-17, but discounted tickets to multiple EarlyWorks museums can be purchased as well. Looking for some free educational learning fun? Families can enjoy a liesurely walk downtown in the Twickenham Historic District. Here, you can see some of the cities oldest and most historic homes, as well as beautiful examples of period architecture. One of the most notable homes, the 1819 Weeden House is open to the public for display, as are some of the other homes in the district. This of Sci-Quest as one big playground with learning side effects. Even children who despise science will have a blast here. When they say hands on, they really mean it. Every single exhibit in this large science center is full of hands on fun. Being a mom of four boys, one of the highlights for my family was the Grossology area. Beware of the Sniff Test exhibit though. Boys will be delightfully grossed out by the smell of armpits, bad breath and dirty feet, and trust me, they will smell them all. Be a real life weather man, learn about nano technology, explore energy circuits, shadows and sound waves. Honestly, the possibilities for learning here are endless. There is a play room for younger children as well as a water table, so families with children of multiple ages can come and enjoy an afternoon of educational fun. Tickets to Sci-Quest Hands On Science Center are $10 for adults and $9 for children ages 2-18. Perhaps one of the most well-known and popular family-friendly attractions in Huntsville, the U.S. Space and Rocket Center is easily an attraction that will take your family and entire day to enjoy. Dr. Wernher von Braun helped put Huntsville on the map as "The Rocket City" through his work at NASA's Marshall Space Flight Center, where rockets were developed that launched the first satellite into space and sent the first man to the moon. It was Dr. Wernher von Braun who dreamed of a museum where the public could come to see the technology of space exploration in action, and it is he who inspired the creation of the U.S. Space and Rocket Center, which opened its doors in 1970. Today, you can see artifacts and technology that played such a vital role in space exploration, as well as see new technology being developed for the next phase of the space program. Hop into a simulator for a Mission to Mars, check out the Robot Zoo and try your hand at controlling a robotic iguana, view one of only three Saturn V rockets in the world, and take a stroll through the Rocket Garden. Those are just a few of the activities families can look forward to when they visit the U.S. Space and Rocket Center. Tickets to the center are $20 for adults and $15 for children ages 5-12. If you are looking for a great living history museum, then Burritt on the Mountain is one of the best we have ever encountered. Home to Dr. William Henry Burritt, his mansion and land was donated to the City of Huntsville, and became its first museum in 1955 upon Burritt's death. Today, you can tour Dr. Burritt's mansion, as well as the park which contains restored 19th century houses and a barnyard with hands-on activities to keep children entertained and learning. You can start your visit to Burritt on the Mountain with a tour of Dr. Burritt's mansion. Admire the beauty of the architecture, view of the city of Huntsville below, and take in the latest exhibit in the home itself. During our visit, it was an exhibit on the history of Huntsville itself. Don't forget to check out Dr. Burritt's restore car in the garage. A new program to the museum is the Time Travel Adventure. Children of all ages can pick up a scavenger hunt paper in the gift shop, and fill it out as they travel back in time through the various decades of the 1800's. 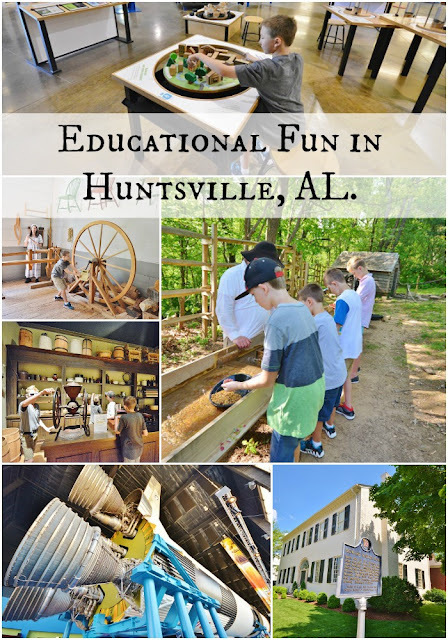 Along the way, they will discover facts from the specific decades about Alabama and the country as a whole, as well as hands-on activities like old time game play, racing wooden rafts down a creek, sluicing for gold, tending a garden or trying to find their way through the maze representing the Underground Railroad. Don't forget to spend some time saying hello to the various animals in the barnyard, playing a round of lawn darts, or trying out the themed playground. Be sure to budget at least a few hours for exploring the exhibits here, as there are plenty of spots the kids will want to revisit. Tickets for Burritt on the Mountain are $10 for adults and $8 for children ages 3-18. A perfect way to put a reflective end on an evening in Huntsville is to visit the Huntsville Madison County Veterans Memorial. Visit on a weekend evening and have the place to yourselves. This memorial was created in remembrance of the veterans throughout history who paid the ultimate price for our freedom. Families can visit for free, and take in the beautifully done statues that represent both honor and sacrifice as well as learn about each of the wars throughout history and their costs to this nation. It is a sobering attraction that is worth a visit when you come to the area. When visiting the U.S. Space and Rocket Center, don't forget to save room for lunch at their Mars Grill. Here, you will find a range of crowd pleasing favorites from bacon cheeseburgers to personal pizzas. I highly recommend the salad bar with its ample toppings. Want a truly amazing pizza dining experience, Sam and Greg's makes incredible pizza pies, I recommend the Guido myself. Their location is very convenient when visiting the EarlyWorks museums, just a short walk up one block on the square around the courthouse. Stop by and see the oldest operating hardware store on your stroll there. Do yourself a favor and save some room for gelato for dessert too. If you like Greek food, you can't go wrong with a dinner at Taziki's. Just a few minutes away from Burritt on the Mountain, they serve up authentic chicken and lamb gyros, as well as delicious sides. Try the hummus with homemade pita chips and red potatoes as a side, you won't be sorry. I know all too well how hard it can be to find family-friendly accommodations for a large family. 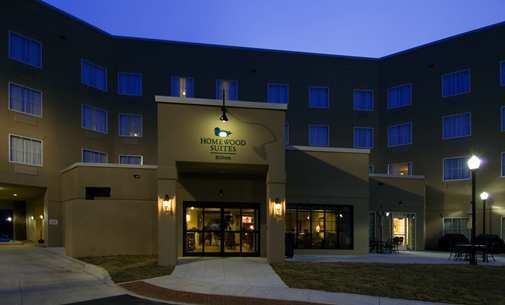 Homewood Suites by Hilton Huntsville-Village of Providence is centrally located, has spacious rooms and large two bedroom suites, as well as affordable prices. Visit Monday-Thursday and you will get an evening meal served for free as well as a complimentary hot breakfast. Standard amenities are included in each room, with kitchen area in each of the suites. This is a huge money saver for big families who can cook in instead of eating our their entire visit. The hotel does feature an outside pool and business center with computers as well as a laundry room. One of our favorite features was the ability to check out movies each night of your stay to enjoy in your room. The boys and I picked out two each evening to enjoy together. The hotel's location is the Village of Providence is beautiful, and provides the perfect place for an evening family stroll. There are several delicious restaurants located within the village area as well, but many more are just a few minutes away by car. Ready to start planning your family trip to Huntsville, AL. with your kids? Visit Huntsville, org to start building your personalized itinerary today.